Be the first to share your favorite memory, photo or story of Aline. This memorial page is dedicated for family, friends and future generations to celebrate the life of their loved one. 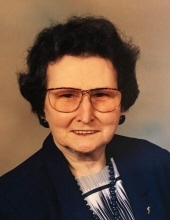 Aline E. Roedl, 88, of Fredonia, Kansas passed away Thursday evening at her daughters’ residence in Merriam, Kansas. Aline E. Roedl was born June 15, 1930 at Marque, Texas the daughter of Elbert M. Moon and Lula (Ferguson) Moon. She grew up in Beaumont, Texas and attended Beaumont schools. On April 8, 1950 in Beaumont, Texas she was united in marriage to Frank F. Villiva Sr. and he preceded her in death April 26, 1960. She married Lawrence M. Roedl Jr. August 2, 1964 in Beaumont and he also preceded her in death November 30, 1991. Aline enjoyed going fishing, reading, watching movies and sewing. She was a wonderful cook and made a mean spaghetti sauce. She lived in Texas until moving to Fredonia in 1989. She was a member of the Sacred Heart Catholic Church. Survivors include her children, Nanette Ferguson of Merriam, Kansas, Frank F. Villiva Jr. of Brooklyn, Texas, 4 grandchildren, 3 great grandchildren. She was preceded in death by her parents, 2 husbands, 3 sisters and 4 brothers. Celebration of Life Funeral Services will be held 11:00 A.M., Wednesday, April 3, 2019 at Wickham Family Funeral Home, 510 West 7th, Fredonia, Kansas. The family will receive friends from 10:00 A.M. until service time at the funeral home. Interment will follow the service at Sacred Heart Cemetery in Fredonia. Memorial remembrances are suggested to the Sacred Heart Catholic Church and they may be left or mailed to the funeral home. To send flowers or a remembrance gift to the family of Aline E. Roedl, please visit our Tribute Store. "Email Address" would like to share the life celebration of Aline E. Roedl. Click on the "link" to go to share a favorite memory or leave a condolence message for the family.